We finally wiped off all the slobber marks and took a picture of our new La Marzocco GB5 – a beautifully, handcrafted, state of the art Italian Espresso Machine from Florence, Italy. Wow,Whoa,Wow is all we can say at this point. The espresso, the crema, the sight, sounds and smells of our Dancing Goats Espresso brewing are incredible. Our new machine allows our baristas to utilize all their training, skills, knowledge and carefully roasted and blended espresso beans to produce a complex, incredible tasting work of art. This is a cutting edge, culinary experience that we are excited to introduce to you. 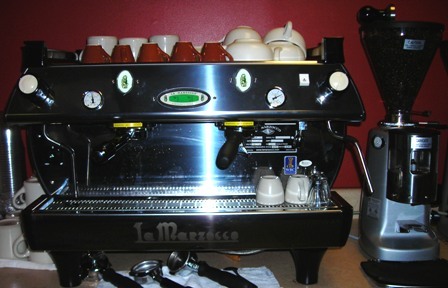 I’ve been told that we have the 1st La Marzocco GB5 in Pittsburgh. That’s cool, but we have never been about cool. Tazza D’Oro has been about a commitment to quality and partnering with vendors who are committed to quality, exceptional business practices, sustainability, support and tradition. Batdorf and Bronson has celebrated 20 years of excellence and La Marzocco has been designing, manufacturing and handcrafting espresso machines for 80 years. Now, that’s cool!! PS: Heather, Oliver and all the folks at Batdorf and Bronson – xoxoxo. The really shiny mark in the picture of the espresso is our beam of pride and excitement. Congrats on the purchase. Didn't realize you were talking this year when you indicated you were getting one! If we may ask, what did you do with the old Linea? Hey Rich- Not sure about the old Linea. I'm kicking around the idea of keeping it to use for training. ooolala She's a beauty!Bella bella bella! coco chanel! Welcome to your new home! Nice machine! Temp stability IS a wonderful thing, and I'm sure you'll find many other things to like about your new gear. Enjoy!